Dandelion is a perennial herb thoroughly familiar to every one, as it is found almost everywhere throughout all temperate and north temperate countries. The poor of nearly all countries collect the young, crisp leaves in the early spring and prepare therefrom a salad, resembling lettuce salad. The leaves are also cooked, usually with leaves of other plants, forming "greens," highly relished by many people. The principal use of this plant has thus far been medicinal, but its value as a curative agent certainly has been overrated. It has been used in dropsy, pulmonary diseases, instomach derangements, in hepatic or liver disorders, in icterus, blotchy skin, and other skin diseases, for biliary calculi, in hypochondriasis, etc. It has no marked curative properties in any disorder. Beyond mildly laxative and tonic properties, it has no effect whatever. 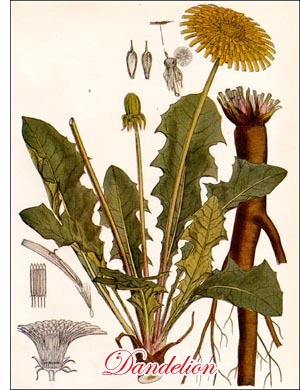 Using taraxacum preparations for a considerable length of time causes digestive disorders, mental excitement, vertigo, coated tongue, and nausea. In lawns, the plant proves a great nuisance, as it displaces the grass, and it is difficult to exterminate. The plants must be dug up, roots and all, carted away, and burned. This should be done early, before the seeds are sufficiently mature to germinate. For medicinal use the roots are gathered in March, July, and November, cleaned, the larger roots cut longitudinally, dried, and packed, to be shipped to points of consumption. The juice expressed from the fresh roots is also used.